Let me set things straight from the get-go. I am not a crocheter (is that even a word?). I most certainly know my way around a ball of yarn when it comes to knitting, but I can’t read a pattern to save my life, so my crocheting skills haven’t progressed past the basic stitches. Make a chain of 45-55 stitches; try this chain around your neck to see that it will be the proper length. Turn and work your Double Crochet Stitch to the end. Turn, remember to chain 2 stitches before you continue to Double Crochet the row (*I also like to count my stitches after I complete a row, I find if I don’t it ends up getting lop sided*). Repeat. Repeat until your ball of yarn is gone, or you feel it is bulky enough. Join ends together to make a circle. You may choose to put a twist in it before connecting the ends together, or sew 3 buttons down one side. No need to fuss with button holes, your project is holy enough, just stick them through where you see fit. Now sit back in amazement that you crocheted a project, and proceed to make one for everyone you know. Happy learning! P.S. I totally feel weird about photographing myself for this post, but I really had a hard time getting a good shot of the cowl. I tried Ruby but it fit her like a jacket! I just did one last week, varied one row double crochet with more of a decorative stitch. It turned out great! Yours looks great too. Always looking for quick, last minute gifts, and this definitely is one. Thanks! Brecky would you mind getting your pattern to me. I am willing to pay for patterns. I am going to make one like this also I have 5 I would like to make but all different for Christmas gifts. I have 3 adults and 2 teenagers to make for. my mail is carlolyntucker55@sbcglobal.net. Thanks for the design- did I miss a step how many width rows? Just as bulky as you’d like to have it. I went until the yarn was gone! Been looking for a project a shut-in friend may crochet standing or sitting as her O2 machine maintains her quality of life. This is grand! Thank you, v! How I appreciate your sharing! Keep Looking UP! So glad you gave it a try! Very nice! I love the chunky yarn and want one in every color! Thanks for sharing:) Love the color and buttons. 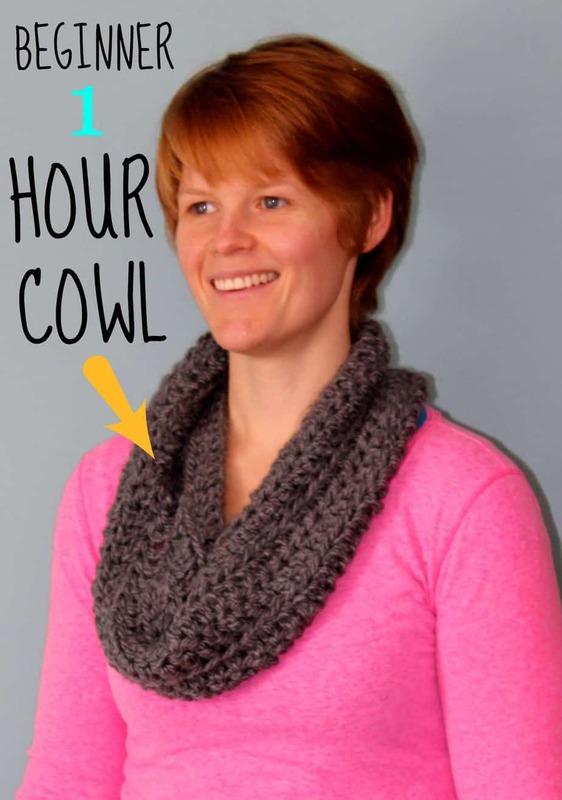 Will be making one to add to my cowl collection! Thanks again! Super cute. I am new to crocheting and not sure how to join the ends into a circle. Can anyone help? You can either sew it up with a needle, or crochet it together in the same manner as you created a row. LOVE THIS! Made one in a chunky chocolate yarn last night. Can’t wait to get get a couple spring colors for some in other colors for this time of year—that in-between time. Thank you for sharing!! Glad to hear you put it into action, they are so cozy! Really cute. Thanks for the idea. This looks great! 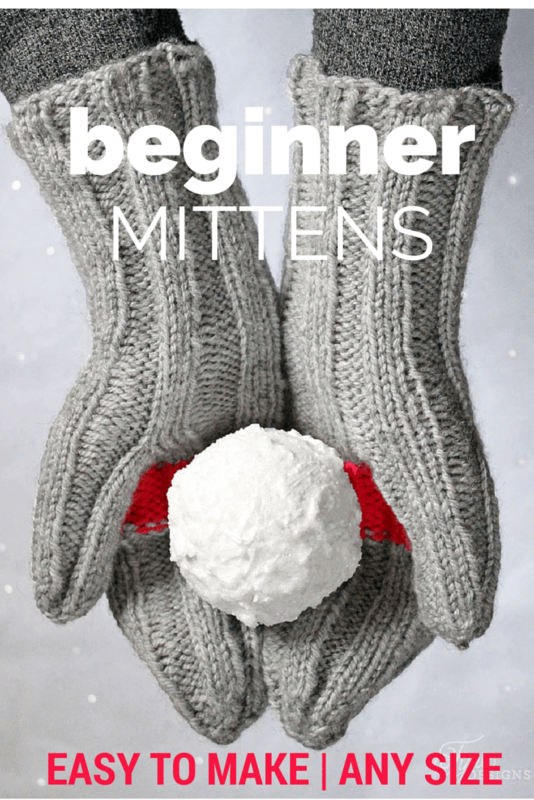 I’m just learning and have just completed fingerless gloves so this will definitely be next! After making the initial chains, do you add 2 chains as you will do in the following rows? Yes you do, just be sure to count your chains when you’re done a row to make sure you’re on the right track. 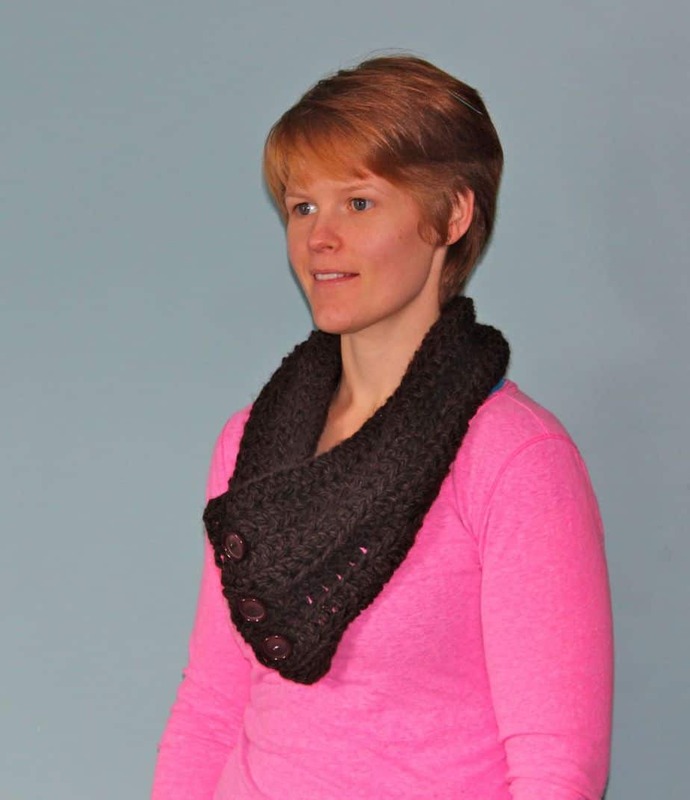 Virginia, what a fabulous cowl! Bravo for the easy pattern, too. Your craft work is lovely, and it’s a real shame if you aren’t doing much with crochet — you’re a natural. If you’d like help with pattern reading, please let me know because I have some resources available that you might find helpful. No problem Amy, I hope you’ve been getting lots of hits! I might just take you up on the pattern reading help, I save my yarn projects for the fall when the weather gets cooler and we can’t be outside as much. Thanks again for the visit! I used your idea but instead of joining together at the end I just joined the end of the chain & crocheted around in a circle. I’m new to crochet & cannot maintain a straight edge so this saved me that frustration. Thank you for an easy, useful project that anyone can do! I’m glad you enjoyed the quick tutorial, Yarn projects are so rewarding and practical, have fun! I’m sure this will do the trick for you! Oh thank you. All of my college girls want scarves for Christmas and I can’t wait to do this!! Awesome! I’m sure they will LOVE them! Happy crafting! Sorry I’m not sure about the ounces, I just used one ball of chunky yarn. how does the chunky yarn compare to skeins of yarn in amount, a skein has about 5 0zs. To be completely honest, I’m not sure. I’ve only made it with the chunky, but if you give it a try I’d love to know! I love this. Wish I knew how to make a chain. You can find lots of directions on about! Isn’t it great that you can create something with only a few basic stitches! Good luck, I’m glad I could be an inspiration to get you going! Hi Virginia, do you know what size crochet hook you used? I want mine to be as chunky as yours! I honestly can’t remember… But it was a fat guy! Probably as big as my pinky finger, I hope that helps! That is a PERFECT tip Jacqueline! Thanks, I’ll have to give it a try! Just found this via Pinterest. I’ve been crocheting for years and can’t wait to crank this out. The buttons are such a fun twist. I think I might try this length and then another one long enough to double. If you’ve been crocheting for a while then you can throw one of these together in no time! I’m glad you found it Kelly! Have fun on your trip!! What kind of yarn to use for the spring & summer? I’d use something lightweight or maybe t-shirt yarn, good luck, let me know what you decide! Thanks! Love the design and your site. I’m thinking of using some baby yarn I have on hand. Thanks for sharing! How do you count stitches? Michelle, I don’t know if there is a technical way, but when I get to the end of the row, every hole you put your finger into is a stitch. Someone else suggested knitting it round so you don’t have to count stitches. Hope you make one! Can you use a smaller hook? I only have one with me now. Lisa you can use a smaller hook, but if you don’t increase the amount of stitches you’ll get a smaller cowl. Good luck! Just checking to see if you’ve remembered if you used an “N” or “Q” hook. I put 2 skeins together of a multi-colored yarn So it would look like a bulky yarn…still working on it. Thanks for the post! I worked it with an “N” hook and 55 stitches and the twist. I’m a make another this time 45 stitches. Do you remember the brand of yarn you used? Thank you so much for this pattern. 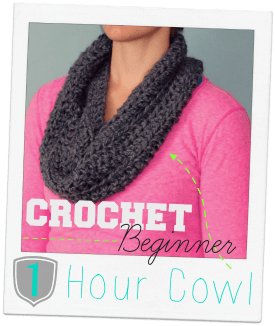 I reallly need cowls for my low neck tops and for a beginner in Croche,t it fills the need..
How can I print these instructions for the one hr cowl? Its been a while since I did this project but I think I meant to put your hook through two stitches. Hope this helps, good luck! I thought for a double stitch you had to chain 3 for your next row? I’m learning by you tube with the crochet guru and in her video it’s 3 for a double stitch and two for half a double stitch. That could certainly be a possibility, I don’t have a lot of crochet experience, I’m just sharing how I made this cowl. Many others have made it also and have found the pattern to work, I hope you get it sorted out! Thanks for stopping by! English-what they call a dbl cr is actually a sc I believe. Anyone else that can verify this?? Yes, you have to chain 3 for a double crochet, chain 2 for a half-double, and chain 1 for a single crochet. The chain counts as the 1st stitch in that row and it called a turning chain. You need to do 3 in order to get the height to match the double crochet. To print the instructions: Open a word processing program (i.e. MSWord or WordPerfect – whatever you use) then “copy and paste”. In case you don;t know how to do that, highlight the text you want to copy, go to Edit, choose Copy, open your word program, right click where you want the text to appear and choose paste from the dropdown menu. To copy a picture, right click the picture, choose Copy Image, open your word program, right click and choose Paste. Even with printable instructions, you can eliminate a lot of extra info you don’t need/want. You can eliminate photos though I like to include at least one for reference. I learn a lot from comments such as have appeared here. Thanks especially for the pattern. I would like the pattern. I clicked the pattern button and it takes me to a download. The download says I’m already there, but I can’t seem to get past it to get the pattern downloaded. Bette, the pattern is just the little paragraph below the photo, it is quite simple only a sentence or two. Good luck! I love this cowl. Am making one as a gift for a friend. 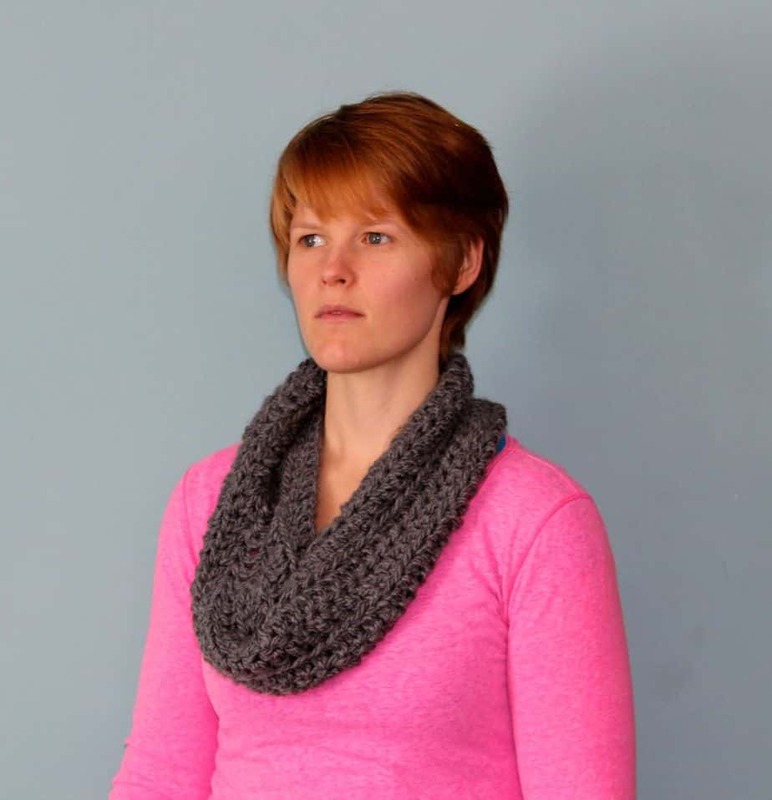 I see several questions that are the same as I have as I am crocheting the cowl and can’t seem to find a reply. I made a guess as to how many ounces of bulky as there are choices of size of skein. I am wondering how many rows or inches the finished cowl is as i want to seemlessly add a scalloped edge and am trying to figure out where to stop to add the edge. Thanks for posting this pattern. Hi Miriam, I wish I could help better, I just used one skien of bulky yarn, and when it was gone I was done. I’m just a beginner! I wonder if you used multiple strands of yarn at the same time. It might give a cool effect?! I am a beginner and this pattern is going really well. I decided to slip stitch and crochet in rounds. As I was making the cowl, I started thinking about doing a slouch beanie. Is there a way to turn this pattern to a slouch beanie? The stitches are easy for me so I want to keep with this simple type pattern for the beanie. Or, do you have an easy slouch beanie pattern that you can point me too? Thanks in advance and thanks for showing us an awesome pattern. Thanks for visiting, unfortunately I’m a beginner crocheter so figuring out how to decrease isn’t something I should teach! But I’m sure if you knew how to decrease and crochet in a round it would be easy to create it into a beanie. This is wonderful, I am going to pin it and make it for my daughter for Christmas! These are very pretty! I use to crochet afghans, but hands can’t handle that anymore I could probably crochet a cowl, and I do know double crochet. Would love to make a few for Christmas. Thanks so much for sharing, pinning! Thanks for visiting Linda, this project will come together MUCH quicker than a blanket, they really make great gifts! This looks wonderful. I am always looking for presents for my girls. Thanks for the pattern. hi! can you tell me why you need to chain 2 when starting every row? just so it doesn’t get lopsided. I created this a long time ago, sorry i can’t quite remember.